In this Photoshop Class we are going to batter understanding about Photoshop background changing and I will be explain all the things that can very much useful to all day work on Photoshop. 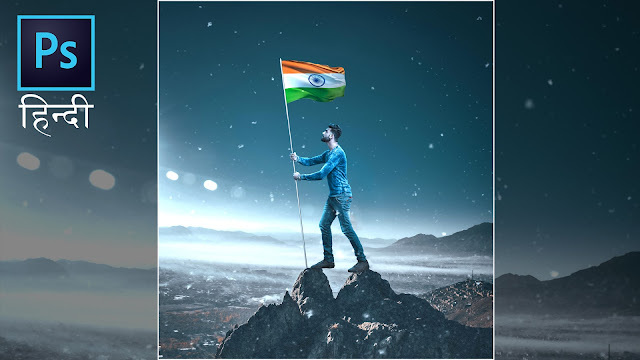 In this Hindi Photoshop Class I will teach you how you can design a Photoshop Poster for this 26 January or Republic day in very simple and easy way. Important to do Photoshop background changing and making manipulation. so guys lets start the video. everyday and every time to retouching of manipulation activities. so this trick make your work very much simple and take less time and save your time. so without further delay lets Gets start the Video and Learn the trick in Hindi. In our daily life, we come across a wide range of posters and advertisements promoting different businesses in a unique way. The poster must be eye-catching and deliver the useful information to the people. Powerful Tools and Techniques to use in background changing and add Subject with the Background in Photoshop. Right from making selections with pan tools and cut out the subjest and blending to creating shadows, in this tutorial. i will go through the complete process of making the perfect composite step-by-step in Hindi. Using interesting tools like camera raw filter, gradient maps, and dodging and burning to get the subject match the background.